Null hypothesis significance testing (NHST) is the most common statistical framework used by scientists, including archaeologists. Owing to increasing dissatisfaction, however, Bayesian inference has become an alternative to these methods. 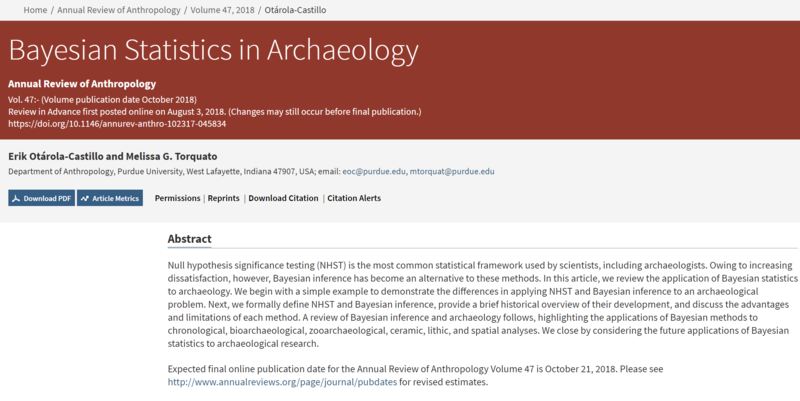 In this article, we review the application of Bayesian statistics to archaeology. We begin with a simple example to demonstrate the differences in applying NHST and Bayesian inference to an archaeological problem. Next, we formally define NHST and Bayesian inference, provide a brief historical overview of their development, and discuss the advantages and limitations of each method. A review of Bayesian inference and archaeology follows, highlighting the applications of Bayesian methods to chronological, bioarchaeological, zooarchaeological, ceramic, lithic, and spatial analyses. We close by considering the future applications of Bayesian statistics to archaeological research. Expected final online publication date for the Annual Review of Anthropology Volume 47 is October 21, 2018. Please seehttp://www.annualreviews.org/page/journal/pubdates for revised estimates. Dissection, MicroCT Scanning and Morphometric Analyses of the Baculum. Physical fitness differences between rural and urban children from western Kenya.